Louella Slimp Boyd, 87, went to be with her Lord and Savior, Sunday, April 14, 2019 at 4:15 am at Holiday Hill Nursing Home in Coleman. Service will be held at 2 p.m. Wednesday at Concho Baptist Church, 1700 S. Concho St., Coleman, TX. Interment will follow at Coleman City Cemetery. Visitation will be held 6 to 8 p.m. Monday at Heartland Funeral Home, 303 Early Blvd, Early TX and 6 to 8 p.m. Tuesday at Henderson Funeral Home, 1600 S. Concho St, Coleman, TX. Louella was born January 12, 1932 in Aurora, Texas to Rev. Taft L. Slimp and Cassie Brown Slimp. She married Grady Boyd on June 17, 1989 in Coleman. She began playing the piano and organ for church when she was nine years old and played for 77 years. Louella played for 59 years at Concho Baptist Church. 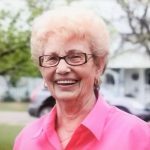 She worked as a secretary for Bealls Department Store in Brownwood. She was a teller for 3M Credit Union for many years. She was preceded in death by her parents, Rev. Taft L. Slimp and Cassie Brown Slimp, and daughter, Cathy L. Knowles, and brother T.L. Slimp Jr., and a brother-in-law Dan Chaney. Survivors: Husband and soulmate, Grady Boyd of Lake Brownwood; sons, Foy Wayne Knowles, Jr. and wife Cindy of Baird, TX and Roy Layne Knowles and wife Shawna of Granbury, TX; daughter, Brenda Gray of Springdale, AR; grandchildren, Troy Knowles, Cody Knowles and wife Mary, Jarett Knowles and wife Brittany, Andy Knowles, Brendan Knowles and Sydnie Knowles; great grandchildren, Kady, Maylee, Jasper, Brazos, Austin and Ava; sister, Cathy Chaney of Athens, TX; numerous nieces, nephews, cousins, many friends and her Concho Baptist Church Family. Be the first to share a memory of Louella.